In this video, Darcy walks you through how to play 5 Minute Dungeon by Spin Master Games. It's a real-time cooperative card game that is perfect for family game night. 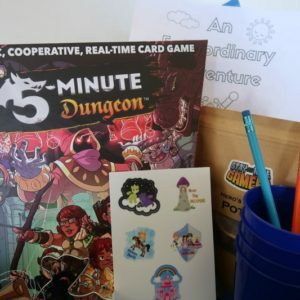 5 Minute Dungeon is the featured board game in our March 2019 Family Game Night Box. We go over the components of this game as well as how to set it up. Darcy explains each hero's special abilities and the special cards while providing a few tips and strategies to help you succeed in defeating the boss before the timer runs out. If you have any questions about how to play 5 Minute Dungeon, please let us know. We are happy to help you! Which hero class do you want to play?